Iron ore deposits near here were mined from ca. 1826 until 1930. Supplied iron to the Confederacy. Location. 36° 9.12′ N, 81° 57.819′ W. Marker is near Elk Park, North Carolina, in Avery County. 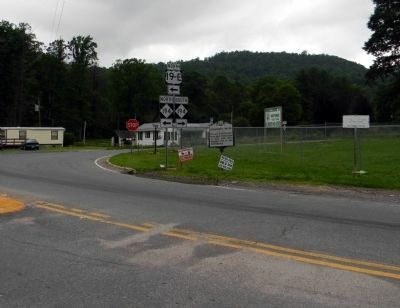 Marker is at the intersection of U.S. 19E and Elk Park Highway (North Carolina Highway 194) on U.S. 19E. Touch for map. Marker is in this post office area: Elk Park NC 28622, United States of America. Touch for directions. Other nearby markers. At least 8 other markers are within 8 miles of this marker, measured as the crow flies. Cranberry Iron Mine (within shouting distance of this marker); Lees-McRae College (approx. 5 miles away); Shepherd M. Dugger (approx. 5 miles away); Banner Elk (approx. 5.2 miles away); Overmountain Men (approx. 5.4 miles away); Yellow Mountain Road (approx. 6.7 miles away); A Woman of War (approx. 7½ miles away); Asa Gray (approx. 8 miles away). More. 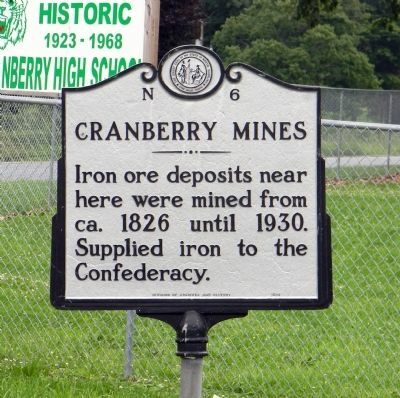 Search the internet for Cranberry Mines. Credits. This page was last revised on June 16, 2016. This page originally submitted on July 24, 2011, by PaulwC3 of Northern, Virginia. This page has been viewed 684 times since then and 9 times this year. Photos: 1, 2. submitted on July 24, 2011, by PaulwC3 of Northern, Virginia. Editor’s want-list for this marker. Photos of modern day views of the Cranberry Mines • Can you help?